Monday: Smithsonian, Museum of Natural History, Crime and Punishment Museum, Air Force Memorial. Tuesday: White House, Supreme Court, Library of Congress, National Archives, the Lincoln, Vietnam, Korean, Jefferson, FDR, and MLK Jr. Memorials. Wednesday: Arlington National Cemetery, Kennedy grave, Challenger Memorial, Pentagon, Iwo Jima Memorial, Ford Theater and Kennedy Center. Thursday: Mount Vernon, Washington Memorial, WWII Memorial. It is just dizzying to think about herding that many kids (40) through all of that for one day, let alone four. 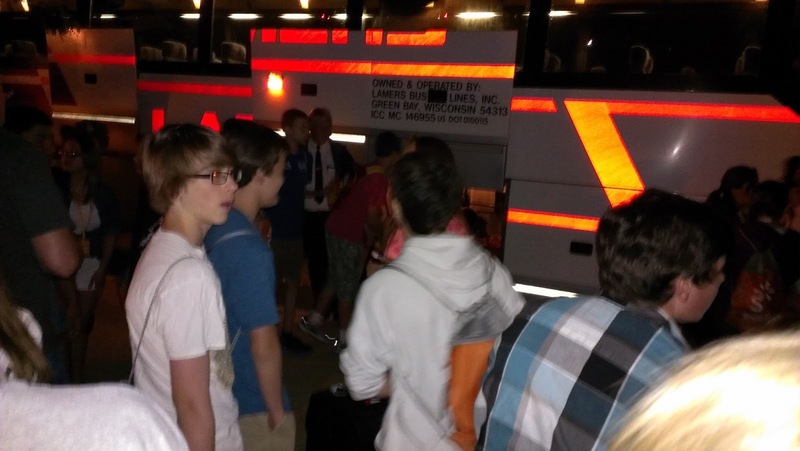 I have the utmost respect for the chaperons (and the bus driver, for that matter.) Tonight they were finishing at the Kennedy Center to see a play. It's my guess there may be some that fall asleep during it. I hope not, but that's a guess. I miss him. I miss him a lot. I miss his awkward teen body, his new-found deep voice, his dirty dishes in strange places, and his shouting at the XBox. I miss his camping out in front of the laptop with his white headphones on, laughing at stupid, zany YouTube videos. When I ask him what he's laughing at, sometimes he feels compelled to show me, and usually I crack up as much as he was. I miss that too. Our house is not the same without him. It is too orderly. Too still. Too clean. I want him back around so my dog has someone else to play "googly shake" with. The neighbors miss his lawn mowing technique that, while is usually thorough, requires my keen oversight to catch the "underlap" strips of tall grass that he missed trying to cut his swaths too wide. It's no fun not telling him to "wrap it up soon" at 10:15 every night. Seems like an odd thing to miss, but it's as much a part of my routine as brushing my teeth is. He's taken to looking at me and going "Yep, I know dad...wrap it up, I know." He's not one to practice his guitar as much as I would like, but I miss the little bit of plucking that he usually does every week. It's weird not having someone around to drink grape juice with his lasagna dinner. I mean, how normal is that? Follow it up with a man-sized belch that knocks the petals off the floral arrangement and, well, what's not to miss about that? Hurry home Ben. I Love You!